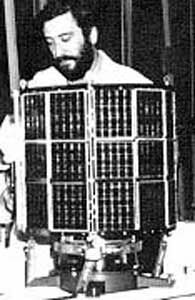 Spanish communications technology satellite. Science, ionosphere satellite for INTA, Spain. Launched 1974. Status: Operational 1974. First Launch: 1974-11-15. Last Launch: 1974-11-15. Number: 1 . Gross mass: 20 kg (44 lb). Family: Communications technology sat, Sun synchronous orbit, Technology. Country: Spain. Launch Vehicles: Thor, Delta, Delta 2310, INTA, Delta 2000. Launch Sites: Vandenberg, Vandenberg SLC2W. Bibliography: 2, 279, 6.